This article will explain everything you need to know about ingrown toenails: how you cause ingrown toenails and how you can treat ingrown toenails at home. – by San Francisco Podiatrist and Toenail Surgeon, Dr. Christopher Segler. The first thing you need to know about ingrown toenails is that you can prevent them. Just make sure that when you cut your toenails, you cut the toenails straight across. Don’t cut them at an angle or curved. Also, don’t cut them too short. That’s one of the best ways to cause an ingrown toenail. You also have to make sure that you have enough room in for your toes so that the corners don’t get pinched and start an ingrown toenail. Ingrown toenails aren’t really caused by high heeled shoes, but they can be caused by shoes that have a tight constrictive toe box because it pinches the corner of the nails and can start it to become ingrown. Rock climbing shoes are a perfect example of this. Many climbers where climbing shoes that are two sizes smaller than their street shoes in order to get a snug fit. However, that can often pinch the toes and lead to an ingrown toenail. Kids often get ingrown toenails from playing soccer. Many times the culprit is actually the shoes that were worn last season and still fit, even though they’re too tight. When they wear these tight shoes and kick the soccer ball, it can easily start an ingrown toenail. But without a doubt, the most common cause of ingrown toenails that podiatrists see is from patients who cut their own toenails, but cut them wrong. 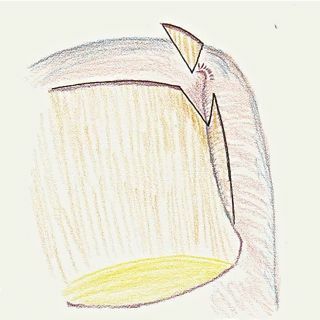 The way this happens is that the toenails get cut just a little bit too short, and then the corner of the toenail starts to become ingrown or hung up in the skin. You can see that illustrated here on the upper right hand corner where the nails is stuck in the skin. The dotted line actually represents the border of the nail that’s not really visible, way down in the corner of that toenail groove. During the very early stages of an ingrown toenail, it is often possible to soak the foot in warm soapy water. That can often times soften the skin just enough that it will free the corner of the nail so that it doesn’t become worse and doesn’t become ingrown. Unfortunately, many patients will attempt to remove the ingrown toenail at home themselves in what podiatrists here in San Francisco refer to as “Bathroom Surgery.” They decide to cut out that piece of toenail and see if they can remove it to get the pain from the ingrown toenail to go away quickly. By trying to cut out the corner of the nail, they stick nail nippers down in the corner as you see illustrated here. 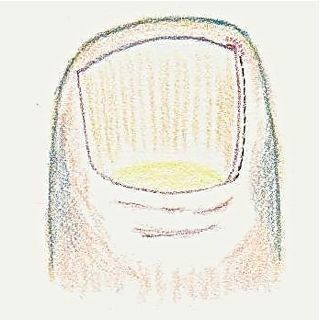 They snip the corner of the toenail and try to get that triangular piece of nail out from the corner of the toenail. But what you can also see here is that a portion of the nail is hidden down under the fold of skin at the border of the nail plate. The nail does not get snipped completely. So then the patient has to jerk on it and pull in order to attempt to get that piece of nail out of there. Most patients who do this will say that they thought the corner of the nail was “stuck to the skin.” But if you snip it completely, it should basically fall right out. If you don’t, the corner of the nail will tear long the cleavage lines of the nail that you can see as faint ridges in the nail. Of course if this happens, you pull out a small triangular piece of nail as you see here. It feels better because it relieves some of the pressure. But what you can also see is that hidden down in the nail fold in this illustration is a little sharp pointy piece of nail that foot doctors call a “spicule.” And that spicule is a disaster waiting to happen. But you can;t even see it because it because it is hidden way down underneath that inflamed fold of skin at the side of the toe. Now that spicule will continue to grow with the rest of the nailplate. And then, if you bump into something like a coffee table or a door jamb, the nail spicule can actually stick right into the end of the toe piercing the skin. Then that skin becomes inflamed and the skin in the corner of the toe grows right over the spicule and the corner of the toenail. This is what causes the severely infected and inflamed ingrown toenail. That is when the patient shows up at the podiatry office with an extremely inflamed or infected ingrown toenail that just can’t be relieved on the patient’s own. At that point, it is too late for ingrown toenail home remedies. Once the nail is actually stuck in the skin, and the skin has grown over the nail, there is really no way for you to remove this at home on your own. At that point you really need the assistance of a toenail surgeon who has been trained to removed ingrown toenails without causing any damage or any additional pain. 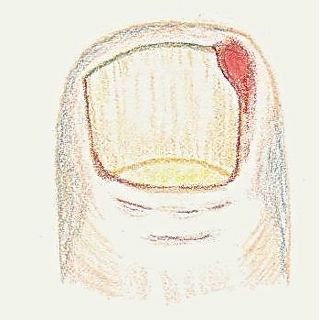 A very simple procedure can be performed where the border of the nail that has actually become stuck in the nail fold can be removed. This provides immediate relief of the pain because the podiatrist actually will numb the toe before he does the procedure. Patients typically feel tremendous relief immediately. The next day they typically feel much better that when the ingrown toenail started, and certainly better than when they sought the help of the podiatrist to have it removed. This is a procedure that provides a huge amount of relief. Fortunately for you, it is a procedure that we can actually perform in you own home. In fact, the podiatrist can come right to your house and quickly remove that ingrown toenail. In San Francisco, we can actually have a podiatrist in your house and have the ingrown toenail removed in less than an hour. Imagine complete relief from that ingrown toenail…one hour from right now! Dr. Christopher Segler is a toenail surgeon and house call podiatrist in San Francisco. If you think you have an inflamed or infected ingrown toenail and have a question about what to do, you can reach him directly at 415-308-0833.